Dunes Meet Playa. © Copyright 2019 G Dan Mitchell – all rights reserved. Desert sand dunes meet the edge of a playa in evening light. A late-winter or early-spring visit to Death Valley is always on my photographic agenda. This year I visited in early March, shortly after a big atmospheric river weather system had dumped tremendous amounts of rainfall all over Southern California. Years ago I became aware of the seeming irony that the effects of water are nowhere more visible than in Death Valley, and on this visit they were even more obvious. Playas were flooded, roads were washed out and closed, mud flows were everywhere, and the colors of the dunes were intensified by the remaining moisture. I made this photograph in the evening of my final full day in the park. The light was challenging — late in the afternoon clouds began to arrive, and as the golden hour approached most of the color was drained from the light. 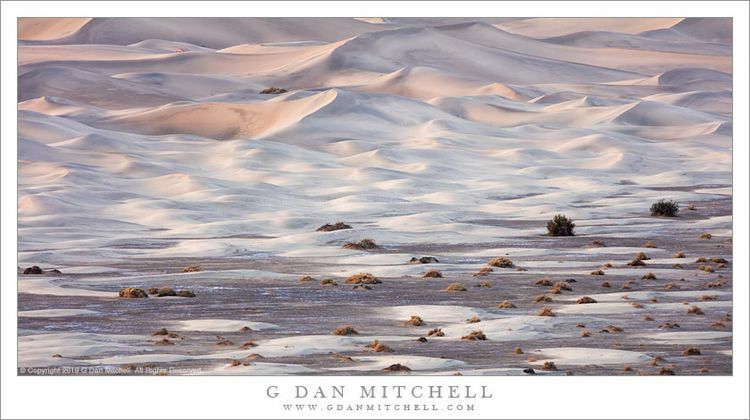 I had traveled to this area of dunes hoping to find some interesting light — and a small group of photographer friends — but when I got there it did not look promising. I decided that instead of going directly to specific dune subjects I would find a high place with a wide panorama. From there I could see the entirety of the upper Valley and be ready to use a long lens to take advantage of any good light that might briefly appear, even if it should be at a distance. As dusk came on the sky opened a bit and glowing light from the west softly lit the boundary between playa and dunes.